The legacy of the Duke of Wellington towers over British history. The hero of Waterloo, vanquisher of Napoleon – poet laureate Alfred Lord Tennyson hailed him as the 'last great Englishman'. Statues still adorn the streets of many British towns and cities while his name has become synonymous with one of Britain's most celebrated victories. So how did Arthur Wellesley become the 'Iron Duke' we remember today? Wellington spent much of his childhood at Dangan Castle, Ireland. The future Duke of Wellington was born Arthur Wesley (later changed to Wellesley) around 1 May, third surviving son in an aristocratic Irish family. His father, Garret, was the first earl of Mornington while his mother, Anne, was the eldest daughter of Arthur Hill, first Viscount Dungannon. An unhappy, lonely boy, Wellington exhibited few of the talents that would come to make his name. Lazy and socially awkward, his early schooling was fragmented, his performance uninspired. Only his violin playing showed any real promise. I vow to God I don't know what I shall do with my awkward son Arthur. Eton College viewed from the river, painted in 1786. When Wellington was 12, his father died. That same year he started at Eton with his younger brother, Gerald. Anne, his mother, thought Wellington a slow, foolish child. His exploits at Eton did nothing to dispel that opinion. Frequently unsociable and occasionally aggressive, with little appetite for learning, Wellington was removed from school in 1784. 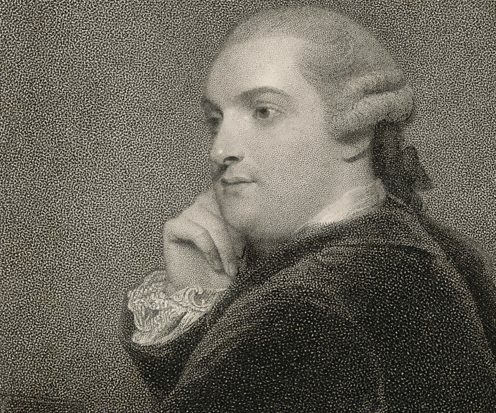 His father's death in 1781 had hit the family's financial standing and another of Wellington's younger brothers, Henry, looked to be a more promising scholar. Wellington followed his mother to Brussels in 1785. As Wellington was making his way in the army, the French Revolution came to a head, including the storming of the Bastille in 1789. 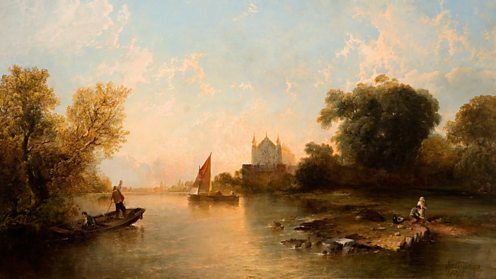 At his family's behest, a career in the military beckoned – few other suitable options existed for such an unpromising young aristocrat. Wellington studied fencing, horsemanship and maths, but remained typically uninterested. His brother’s wealth and influence secured him a number of commissions, first as junior officer in the 73rd Foot and then as aide-de-camp to the lord lieutenant of Ireland. As the French Revolution moved towards its climax, Wellington’s elevation continued, even taking a seat in the Irish parliament. By October 1792 he had held five commissions in six different regiments. 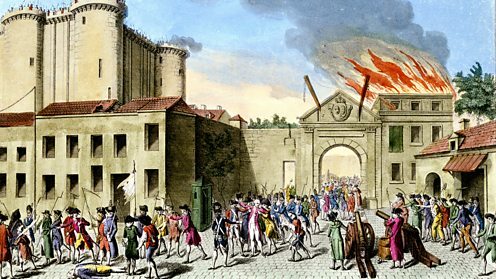 The execution of Louis XVI challenged the established social order not just in France but throughout Europe. Events in France sent shockwaves through Europe. 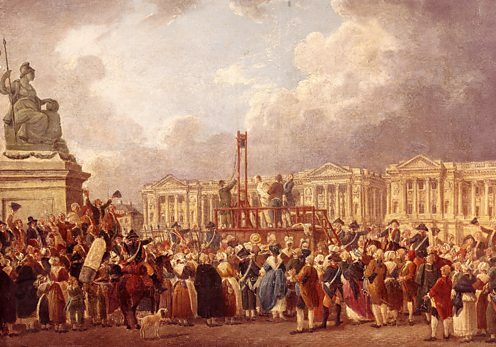 On 21 January King Louis XVI was executed at the guillotine. France had declared her egalitarian principles to be universal. The very fabric of established social order was under threat and by February Britain and France were at war. Wellington had to grow up quickly. He marked his new-found focus by setting aside 'frivolous' things like his violin. In April he joined the 33rd Foot, soon becoming the regiment's commanding officer. This was as far as his brother's influence could take him. He would now have to earn his promotions, on active service. 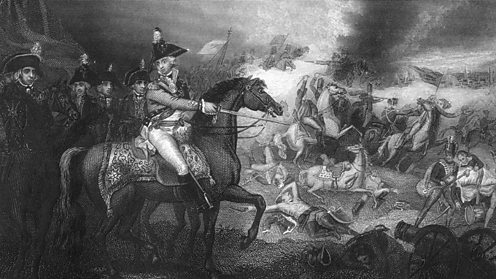 British troops attack the French during the Flanders Campaign. Wellington's opportunity came quickly. In 1794 the 33rd Foot was sent to the Netherlands and he fought the French for the first time. Though Wellington won plaudits for his role in the fighting, the Flanders Campaign as a whole was disastrous. By spring 1795 British forces had withdrawn, dejected and demoralised, and were evacuated from Hanover. The French had won, replacing the Dutch Republic with a client state. Wellington's first experience of war had come with the taste of defeat. Few of his fellow officers, he saw, had known how to command an army. I learnt what one ought not to do; and that is always something! Wellington defeats Indian leader Dhoondiah Waughat the Battle of Conaghull in India. Bad weather spared Wellington a dangerous trip to the West Indies. Diversion to India, moreover, offered much greater career prospects. With him he brought several hundred books, including titles on military history. He was determined not to repeat the mistakes of other officers he had witnessed first-hand. After some early successes, Wellington was promoted to the rank of major general and in 1803 he claimed the first major victory of his career. Facing an enemy force much greater than the 7,000 at his disposal, he won a desperate battle at Assaye, a small village in western India. His name made, Wellington looked to home. I understood as much of military matters as I have ever done since or do now. Wellington hadn't seen Kitty for more than a decade when he proposed to her again on his return to England. Back in England, Wellington was now a wealthy man and growing further in status – he became MP for Rye in April. That same month, he married. 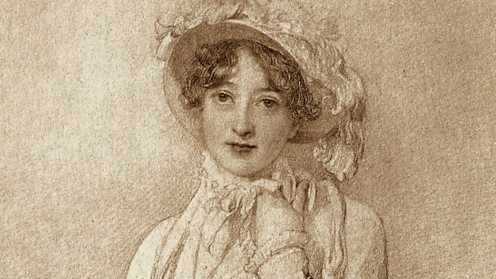 Wellington first proposed to Kitty Pakenham in 1793 but, young and in debt, was rejected by her family. Though there had been little contact in the intervening decade, he proposed once more when he arrived back in England. When he met her again in November 1805, he harboured considerable doubts. She was not the woman he had met all that time before. Nonetheless, perhaps out of duty, he married her and the couple had two sons. The relationship was not a happy one. When the Duke of Portland became prime minister, Wellington found himself well connected in government. Wellington's influence continued to grow. He found himself with several friends in the Cabinet when William Bentinck became prime minister in March. His friends' clout saw Wellington appointed chief secretary for Ireland, taking the position only on condition that it did not interfere with his army career. As it turned out, he needn't have worried. As he drew closer to Britain's political power-brokers, his counsel on affairs of state and the military was in ever greater demand. When the Spanish revolted against Napoleon’s occupation, it was to Wellington that British ministers turned to deliver an advantageous outcome for the Crown. I have got pretty high up the tree since I came home. 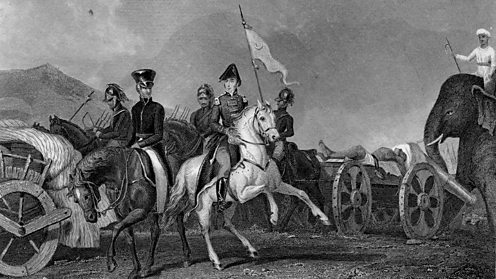 British forces under Wellington's command routed the French at the Battle of Salamanca. Wellington had been in overall command of British forces in the Iberian Peninsula since 1809. In January 1812 he led troops from Portugal into Spain. Early victories saw Wellington reach Salamanca in June but by July he was locked in stalemate with an evenly matched French force. On 22 July, his opportunity finally came. Over lunch an aide delivered the message Wellington had been waiting for: the French had over-extended. A quick glance through his telescope was enough. "Marmont", the French general, he said excitedly, "is lost". 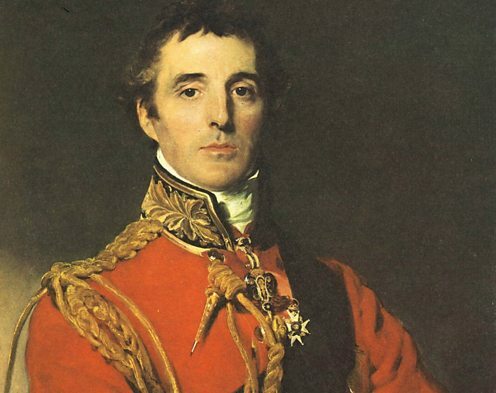 In under an hour, his forces won a decisive victory and all Europe acknowledged Wellington’s military genius. By God! That will do! World leaders descended on the Congress of Vienna to re-draw Europe's borders. Wellington represented Britain. Wellington's victory in Spain and even more devastating French losses in Russia forced Napoleon to abdicate. The duke’s old rival was bested. Victory won him a new title – the Duke of Wellington. Invited to become Britain's ambassador to France, Wellington moved to Paris, even forging relationships with several of Napoleon's former mistresses as the deposed emperor endured exile on Elba. He was now a big name on the world stage. After a hero's welcome on his first return to Britain since 1808, Wellington was dispatched to represent the country at the Congress of Vienna which had been convened to re-draw the map of Europe. Monsieur le Duc était de beaucoup le plus fort. 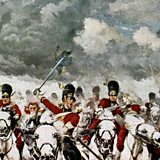 The Duke of Wellington drives his men forward at the Battle of Waterloo. In February, Napoleon escaped from Elba and returned to France. The people and army rallied behind him. Europe’s rulers called on Wellington again. Sitting down to eat at the Duchess of Richmond's ball, Wellington learnt that Napoleon had advanced within 20 miles of the Belgian capital. "Napoleon has humbugged me, by God," he exclaimed. Early next morning he left for the front. On 18 June, the battle that permanently inked Wellington's name into history got under way. 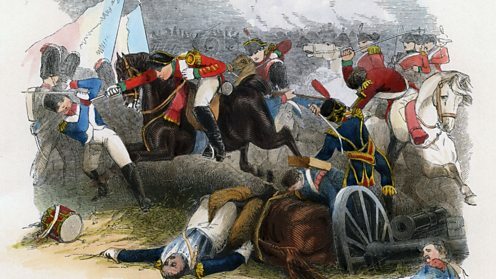 The battle was fierce and bloody but, with his allies, Wellington defeated Napoleon once and for all. Now, at the zenith of his military career, he turned to politics. 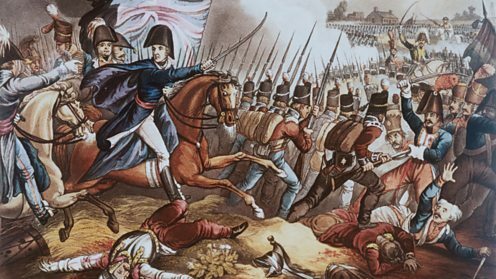 Battle of Waterloo: The day that decided Europe's fateHow did Waterloo affect Wellington? I hope to God that I have fought my last battle. It is a bad thing to be always fighting. 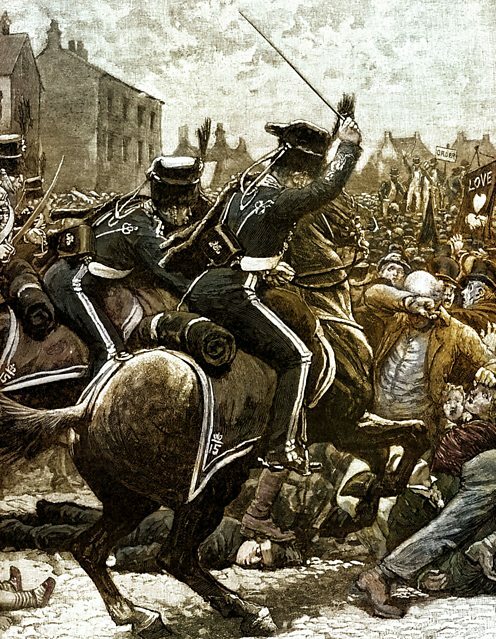 Many were killed and hundreds injured when cavalry charged the protesters at St Peter's Fields in Manchester. Serving under Lord Liverpool, Wellington joined the Cabinet. Politics, he discovered, was every bit as fierce a battleground as those he had left. Liverpool's government was known for repressive policies. 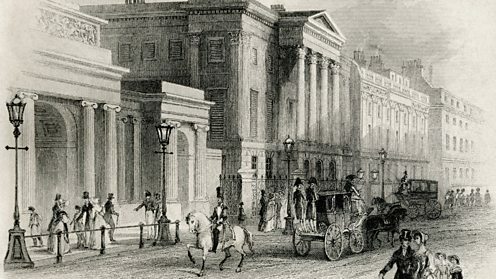 Legislation was passed to keep public order and take action against vagrants, including many discharged from war service after Waterloo. Crowds gathered in St Peter's Fields in Manchester on 19 August to demand parliamentary reform were charged by troops. Hundreds were injured and many killed. The refusal of Wellington and the political classes to countenance social and political reform put them out of step with the public. 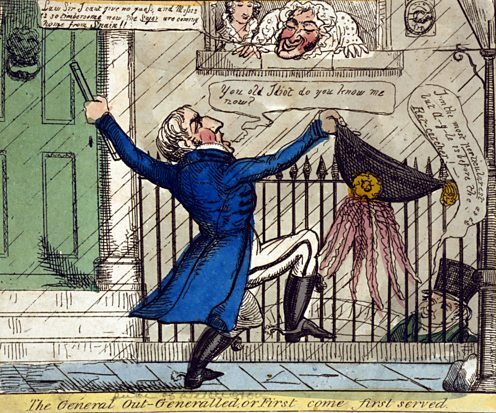 Wellington's affairs were lampooned in the press. Meanwhile, Wellington's first prolonged spell at home since his marriage was doing little to improve his relationship with his wife. He found his wife irritating and burdensome, rarely bothering to disguise his many affairs. One of his lovers, the well known London courtesan Harriette Wilson, wrote a vivid kiss-and-tell book detailing their exploits together. The publisher, pornographer and scandal-monger Joseph Stockdale, even (unsuccessfully) attempted to blackmail the duke prior to its release. Cartoonists and satirists delighted in Wellington's reputation. 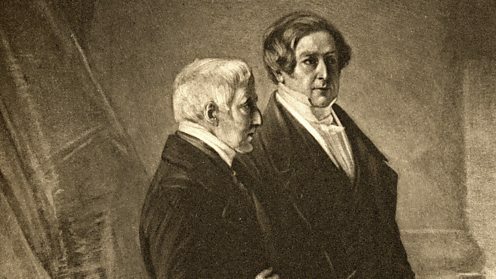 The Duke of Wellington in conversation with adviser and future prime minister Sir Robert Peel. Affairs at Westminster were no less fraught. Demand for reform refused to quieten. In 1828, George IV asked Wellington to become prime minister. The government was beset with problems. Divisions ran deep between warring factions of the parties. His new role was something of a poisoned chalice. Cannier political operators may have refused the position but the duke, dutiful to the last, accepted. He quickly discovered that leading the country had little in common with leading an army. The autocratic style which had served him so well in the military did not go down so well in Westminster. 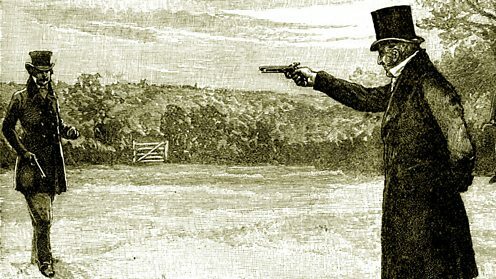 The Duke of the Wellington and the Earl of Winchilsea duelled on Battersea Fields in March 1829. 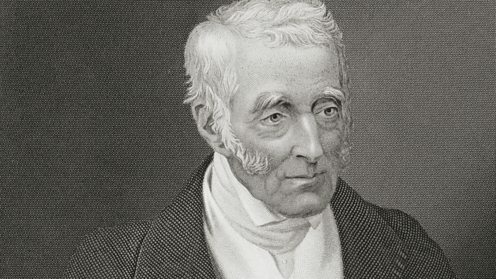 If Wellington thought MPs could be ordered into unity he quickly discovered he was mistaken. One of the most divisive issues of the day centred on Catholic emancipation. 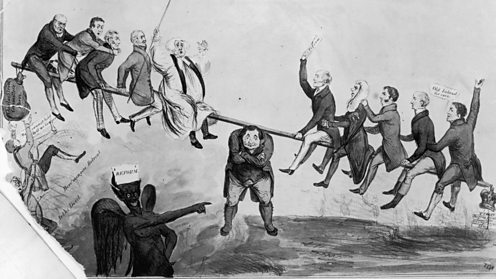 Catholics had been barred from holding public office since the 17th Century but by 1829 these restrictions threatened civil strife. Some Tories, who had championed Wellington's appointment, were aghast at his support for the Roman Catholic Relief Act. 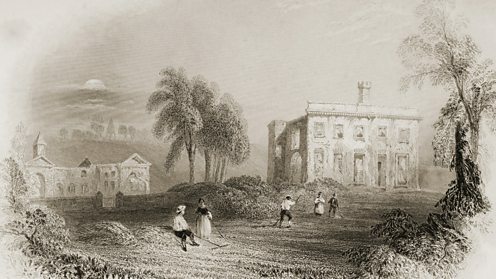 One, the Earl of Winchilsea, was particularly vitriolic in his criticism and on 23 March the duke and the earl fought a duel on Battersea Fields. Both survived. Whig leader Earl Grey led the charge for reform. Wellington had been willing to countenance Catholic Emancipation for the greater good, but parliamentary reform he could not stomach. As a soldier, Wellington had been famed for anticipating what lay "on the other side of the hill" but he lacked the same degree of political imagination. Whig party leader Earl Grey led the calls for reform but Wellington would not budge. Out of step with the times, Wellington's popularity plummeted. He lost control of the House of Commons, his government unable to tread a path between the attacks from Ultra Tories and reformists. By November he had little option but to resign. No soothsayer could have foretold… the extraordinary series of blunders by which the Duke’s fall was precipitated. Apsley House, or Number One London, Wellington's home. Kitty was ill. As her health failed, Wellington re-discovered some affection for his wife. 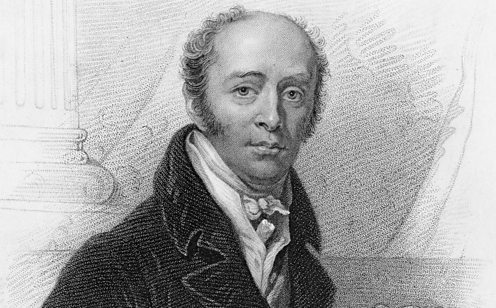 He kept vigil at her sickbed in Apsley House, London. With Wellington at her side, Kitty ran a hand up his sleeve. He was still wearing the amulet she had gifted him decades before. 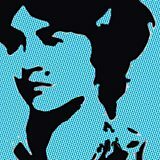 On 24 April, she died. Of little comfort to her in life, Wellington had at least found some common ground with her before her death. How strange it was, that people could live together for half a lifetime, and only understand each other at the end. The issue of reform had continued to dominate the political agenda after Wellington's resignation. Despite the collapse of his government, Wellington had continued to lead the charge against Grey's proposals for parliamentary reform. As his popularity continued to fall, the iron shutters he had installed on his house to protect his windows from the ire of the mob reinforced the image of the 'Iron Duke' refusing to move with the times. But in 1832, with the country in deadlock, Wellington backed down for the sake of the country. After persuading his supporters to stay away from Parliament, the Reform Bill finally passed. Even so, he was mobbed by an angry crowd on Waterloo Day. An odd day to choose. Wellington was almost 90 years old when he eventually retired from public life. Wellington had remained active in government, as foreign secretary and, latterly, a minister without portfolio. Approaching his ninth decade, Wellington finally retired from public life in 1846. Even then he retained his post as commander-in-chief of the armed forces, unable to step away completely from the public service to which he had devoted his life – servant of crown and country to the last. In death, the image of Wellington that people remembered was that of the war hero and conqueror of Napoleon. On 14 September Wellington succumbed to a stroke at his favourite home, Walmer Castle, in Kent. In death the duke's divisive political legacy was forgotten. Wellington was the hero of Waterloo once more. On 18 November, Britain said goodbye to a hero of a bygone age. The nation united in a display of grief more extravagant than anything seen before. More than 1.5 million lined the streets to pay their respects as Wellington's coffin was borne to St Paul's, where a further 10,000 dignitaries packed into the cathedral. Wellington may have been gone, but his reputation lived on. He was the greatest man this country ever produced, and the most devoted and loyal subject, and the staunchest supporter the Crown ever had. 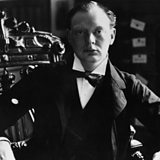 Sir Winston Churchill: The greatest Briton?